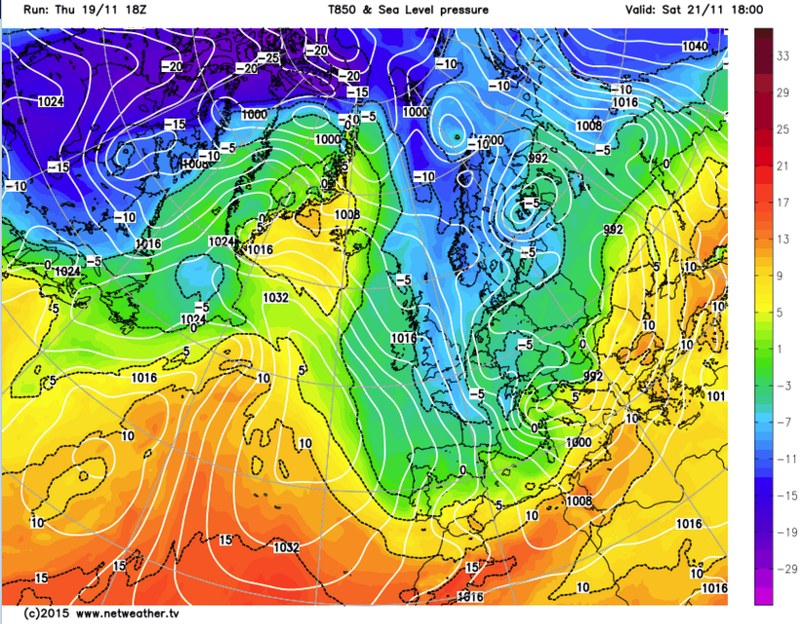 This coming week, Arctic air from Svalbard briefly encounters Tropical air from the Bahamas over Europe. Remarkably, how cold it gets here in the UK and Europe might depend on the story of a sub-tropical storm over the Atlantic just as much as the Arctic air trying to push south. Pressure has built over the Arctic, nudging cold air uncertainly south into European mid-latitudes. The build in Polar pressure and relative fall in mid-latitude pressure is called a negative Arctic Oscillation as mentioned in previous posts. The pattern is already cool because the jetstream is to our south. The jetstream axis essentially divides the warm tropical air to the south from the cool polar air to the north. However, the flow has been mostly westerly and even SW across Southern Britain as the jetstream is blowing purposefully from west to east across the Atlantic. While pressure remains relatively high over parts of Europe (e.g. Med and Spain), the coldest air has been unable to penetrate very far south. 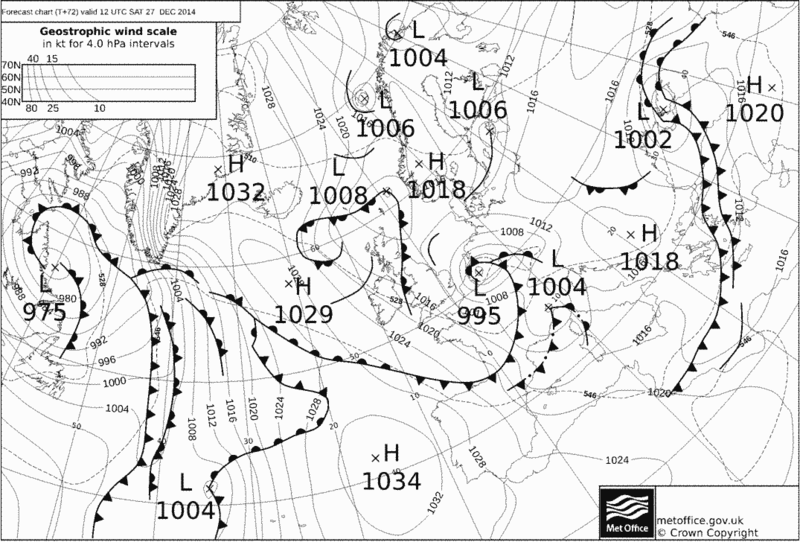 The jetstream chart above shows the unstable flow we have had this weekend bringing heavy thundery showers, some with hail, over Reigate. Check this pic of mammatus clouds this afternoon over Surrey, after thundery showers with hail. 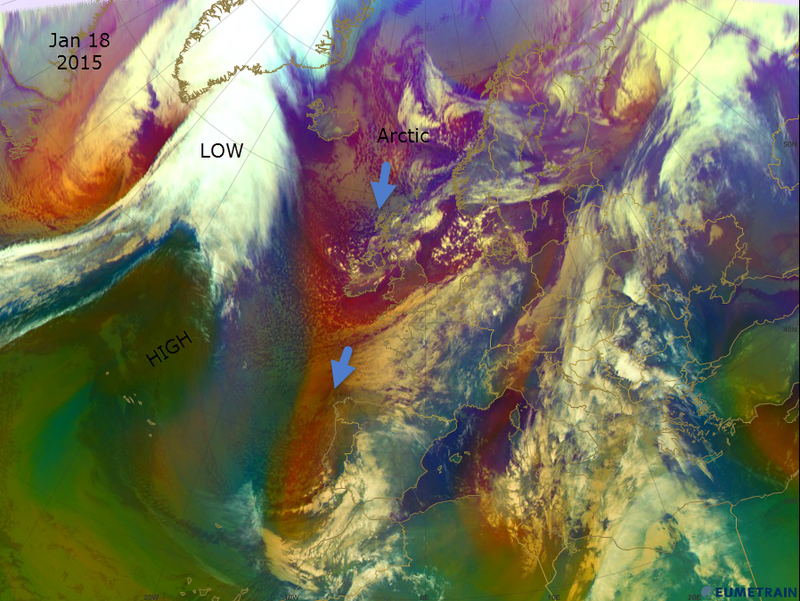 It has been cool because the air has been circulating anticlockwise around a deep low over Scotland with a cold source region over Scandinavia. However, the airmass has been modified with a long track over the Atlantic. With such a strong zonal jetstream the more frigid Arctic air has not been able to penetrate far south into Europe, yet. An unusual sub-tropical storm developed in the Bahamas last week over a very warm Gulf Stream. This low pressure will come to hover in the Mid-Atlantic this week and it might just hold the key to unlocking some more Arctic air over Europe. A part of the sub-tropical system is forecast to cross into Europe mid-week courtesy of a trough disruption. This causes a part of the trough to break away and leave the parent “cut-off” in the mid ocean. In this case, a small but vigorous “baby” LOW will ride off on the right entrance of the jetstream, a good location for deepening surface pressure, and enter Europe via the Bay of Biscay sometime on Wednesday. Whilst this vigorous baby low will not impact the UK directly, it is set to lower pressure over Europe and, in its wake, will drag in Arctic air more purposefully SOUTH across more of the continent right to the Mediterranean. This wind will be significant and create the first proper wintry feel for about three years with wind chill on occasions down to -7C or lower. Importantly, the trough disruption will also build pressure in the Atlantic to the north of the sequestered parent LOW. This is often the case in trough disruptions. The increasing the pressure gradient in the Atlantic and lower pressure in Europe will push more Arctic air more purposefully south across the UK and into Europe. 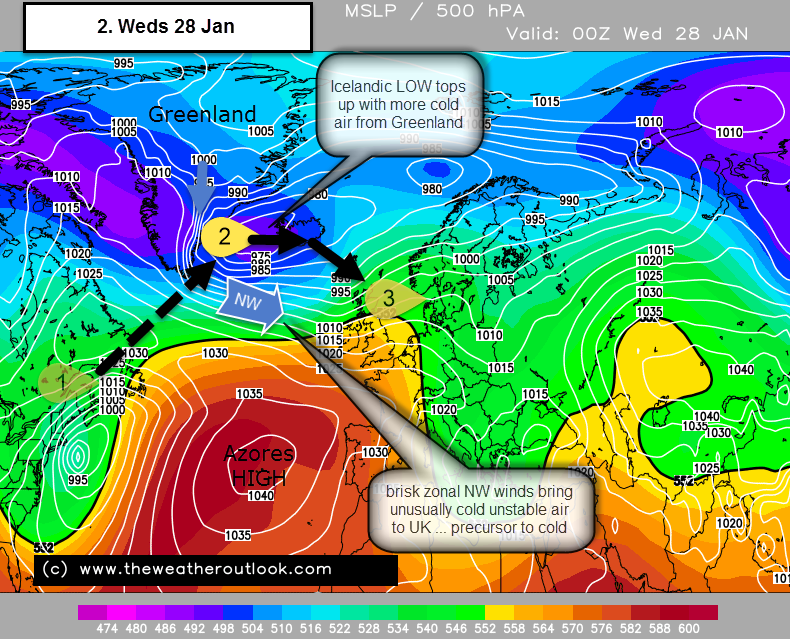 So the sub-tropical system has been key to unlocking the full Arctic blast! Details about snow for Reigate will be updated this week. At this stage heavy snow settling here looks unlikely but some snow fall and wintry showers are certainly possible, especially later mid-week. It will get gradually colder through to the end of the week. Thereafter it is, of course, uncertain! The ECM has been performing better as a model than the GFS so, on that basis, continuing cold is more likely than a sudden return to mild westerlies, which the gfs tends to do too quickly. So assume it’ll stay cold into next weekend. Pleasant mild sunshine of late looks to give way to some cool drab easterly winds this weekend as high pressure builds over Scandinavia. Easterlies this time of year are less cold than in winter as the continent warms under stronger Spring sunshine. In any case, the continent has had a relatively mild winter so there is not much deep icy cold in our continental source regions so we cannot expect much real cold in this easterly episode. Cool, drab cloudy skies are most likely … called anticyclonic gloom. This is built when a large scale temperature inversion occurs: a cold cloudy air mass near the surface stays cold while above the air warms in sunshine and prevents convection going higher. Low level convection, unable to rise, creates low cloud that spreads out as a thick low blanket of stratocumulus often with occasional drizzle. Most unimpressive! Further ahead there are hints of a possible colder mid/late March as some models suggest northern blocking: the Greenland high joining in with increasing pressure over the Pole and lower pressure blocked to the south. This situation can allow polar air to escape into mid-latitudes given the right pressure pattern. A forecast Arctic Oscillation (below) diving steeply negative is also an indication that this might be on the cards. Similarly there is a negative tilting North Atlantic Oscillation too. Both these show indications of going negative. The Madden-Julian Oscillation (below) is an indicator of the activity and location of cyclical tropical convective wave systems that travel east along the Equator. 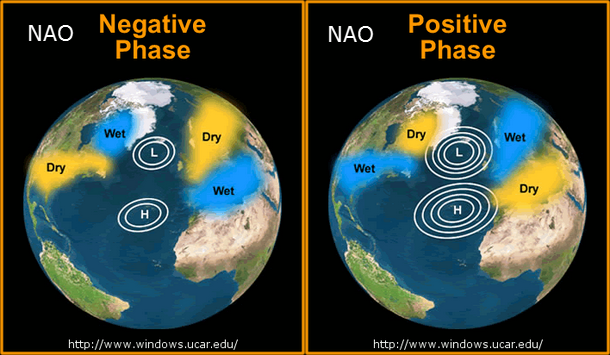 Different phases of the MJO have been connected with influencing different global weather patterns – including tenuously with European/Atlantic weather. The MJO is moving into Phase 7 and this has been correlated with northern blocking and a negative NAO, at least 50% of the time anyway! Some of the models are hinting at the idea of some colder weather this month, but it’s a way off so not certain, worth watching though as a possibility of winters last gasp might catch people out. Reigate stays cool for the first week of February after a couple of modest wet snow non-events overnight this weekend. Snow thawed in the morning each day as temperatures climbed above freezing. Whilst the air temperature was comparatively high at 5.8C Tmax at midday, the stiff northerly wind in Reigate was gusting to 30mph in town which brought wind chill as low as -5C at times. The cause of the current cold weather is a northerly wind set up due to HIGH pressure ridging north in the Atlantic and a LOW over Scandinavia. This sets up a northerly flow, called an Arctic airmass, albeit modified by its significant journey over relatively mild seas. Also, this particular Arctic airmass is not direct from the Pole, if you follow the isobars back from the UK you can see the air originating from southerly areas in SE Europe, so not truly polar. In any case, it’s usual for Arctic airmasses to bring dry weather to Reigate and the SE: the long transit over land means it lacks moisture, usually dumping any significant snow over NE facing coasts well before it gets here. More locally, our sheltered location beneath the North Downs, facing south, also affords good protection from Arctic airmasses and N or NE winds. So, either way, Reigate rarely gets lots of snow from this airmass. 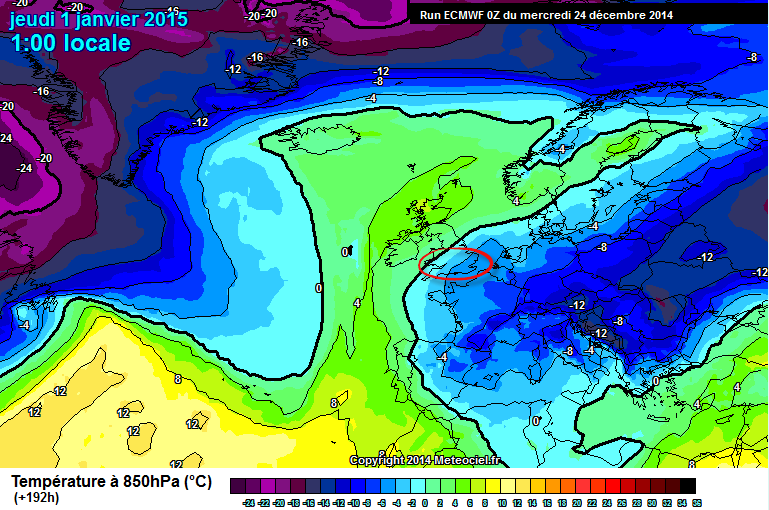 This week is likely to see further cold weather continuing as the HIGH slowly nudges in from the west by mid-week. With HIGH pressure not far away and a relatively dry northerly airmass, a major snow event or indeed much precipitation at all is unlikely. So as pressure rises we can expect a cool mostly dry week with frosty nights and possible fog on occasions in lighter winds (fog not really ’til end of week though as wind remains significant running round high). 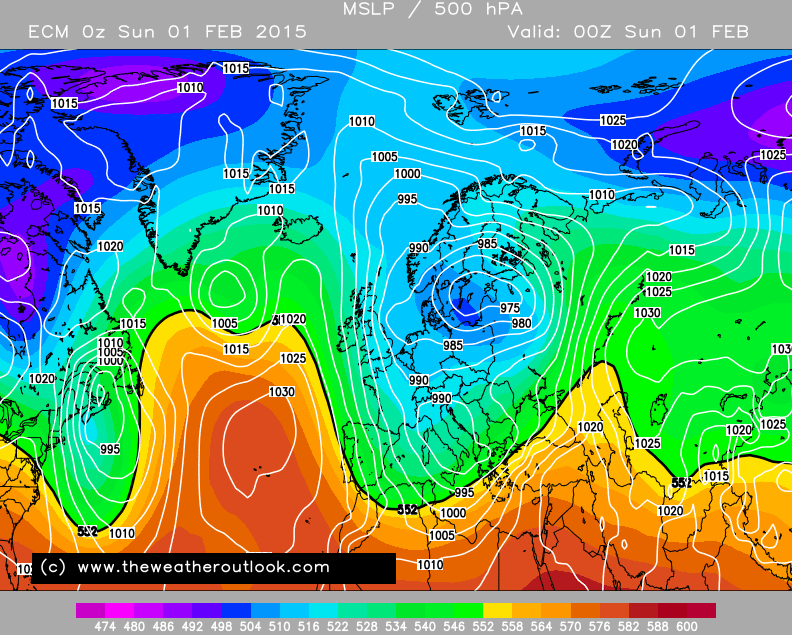 In this set up a big snow event for Reigate seems most unlikely. Nevertheless, an easterly / NE’rly wind for a time is a strong possibility, initially Tues-Weds as a front moves south, and so modestly disruptive snow showers reaching us cannot be ruled out. Also, don’t forget icy roads and fog are arguably the most risky of all winter hazards so this kind of high pressure wintry weather should be handled with care if travelling. At the moment GFS, Ensemble and ECM models are agreeing that the HIGH pressure is likely to land up sitting somewhere to the north / NW of the UK by the end of the week. With unusually LOW pressure in the south of Europe, this could set up a cold easterly wind especially across the south east, albeit this might yet not come off as other runs show the HIGH right over the top of the UK cutting off any easterlies very quickly. The exact position of the HIGH will therefore make a big difference to whether we get much or any precipitation. NE’rly or easterly winds, depending on their strength and track, can bring snow off the North Sea and inland into Kent and Surrey as well. There is already a MetOffice yellow weather warning for the possibility of such an event mid-week, although these often don’t come to much they should not be ignored as the potential for perky snow showers causing local traffic problems has already been experienced with one minor brief thundery shower wintry episode last week. The time-averaged charts show the overall story for the next week as being dry and colder than normal. Throughout this episode the jetstream is wrapping round to the north of the HIGH, actually building it with milder upper air from the SW, and, eventually, it could help to deliver our easterlies at the end of the week. As usual, for exact details check the twitter feed and consult official sites like metoffice for decision making. #Reigate two flaky chances of snow this week? Update Tues pm: system not bringing any significant snow to Reigate, Midlands north might see accumulations but even this is not likely to be disruptive.. The satellite image above shows water vapour and airmasses. Notice how tropical (blue!) and Arctic (red/mauvey) airmasses are intruding across latitudes – plunging respectively north and south of their source regions. Cold Arctic air is reaching right the way down to Spain. 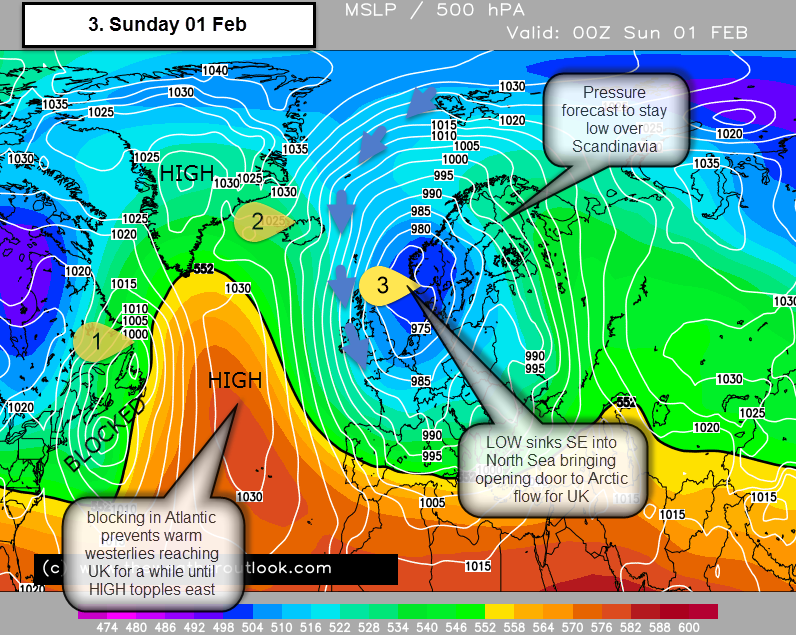 Here’s a look at what is going on and how things might develop for Reigate and SE UK especially this week. Overall things look cold and wintry and there is a slim possibility of snow for us but it’s worth watching the forecasts and twitter updates because it’s very marginal and things can change locally quite quickly. The Arctic air arriving in London Monday left the Kara Sea a week ago. This Arctic air is arriving over the UK courtesy of a high pressure ridge over the Atlantic and Greenland / Iceland which blocks mild maritime air in the Atlantic from reaching the UK. A low (the remnants of storm #Rachel) over Scandinavia is dragging down cold northerlies assisted by a northerly jetstream aloft. This set-up makes this week the coldest since March 2013 and, as some light snow fell in Reigate this morning (Sat 17) then that was the first snow fall here for 2 years. The result of the pressure pattern is airmass temperatures lowering at 850hPa to -7C or lower over the course of the next 48 hours due to the steady invasion of Arctic air. Overnight tonight into Sunday morning a front in the Channel could bring light snow showers to southern England early Sunday morning. The situation is “marginal” as the truly cold air has yet to arrive in the south and dew points are hovering around or above freezing tonight which can make a difference between whether it snows or rains. Over Sunday the Arctic air will arrive and the upper air mass temperature at 850hPa (1500m up) will fall from -4C to -7C by Monday. In such a cold airmass the surface air temperatures on Monday will struggle above freezing during the day to about 3C and wind chill will make it feel colder. 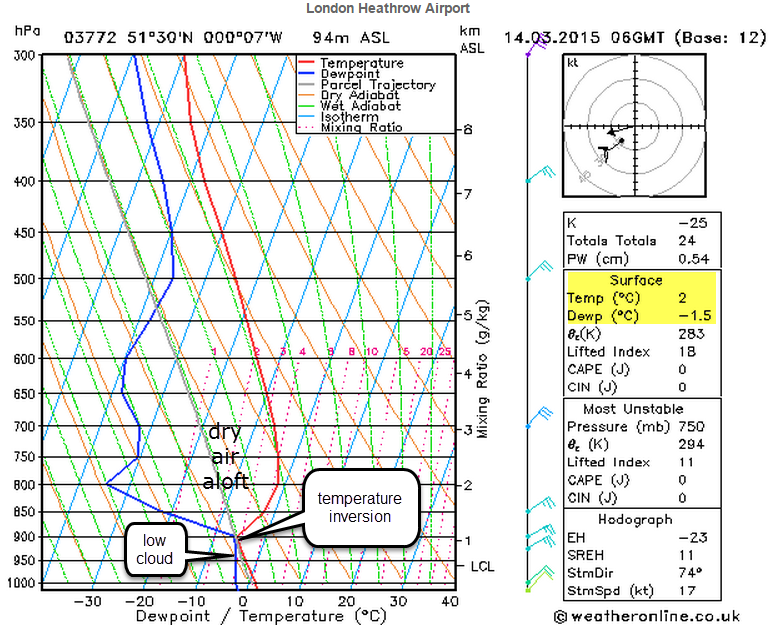 An important threshold for snow is an upper air temp at 850hPa of -5C or lower. So from Monday any precipitation might fall as snow, so long as other factors are in place. The chart below shows the movement of the Shetland low into the N Sea and eventually further south which ushers in northerly winds. There is reasonable model agreement as to what will happen into mid-week but uncertainty thereafter as to how long any cold will last. High pressure is set to build over Scandinavia blocking the NE track of a low S Greenland. A trough disruption is set to occur when the LOW near Iceland splits from the main trough and slides down the edge of the Atlantic high and sinks SE over the UK (called a slider low). 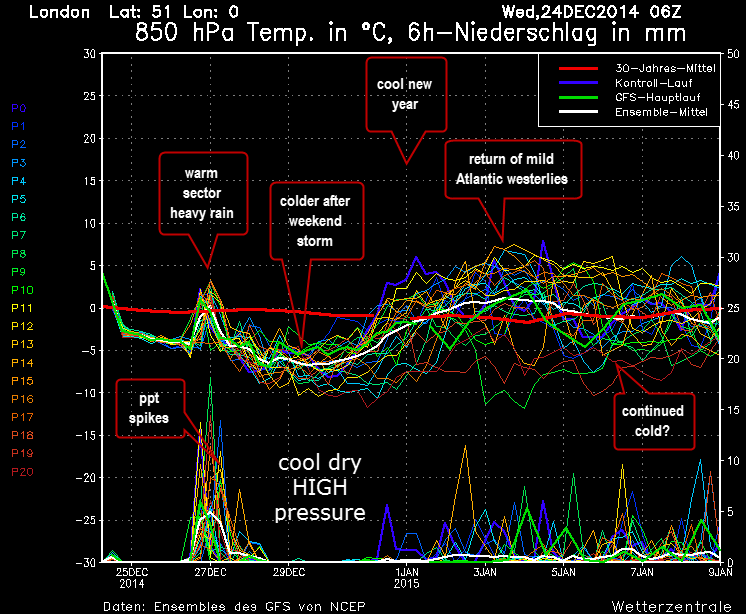 Trough disruptions are notorious for causing models problems with accurate forecasts! The slider low will bring attendant fronts with milder air mixed in, thus complicating chances of widespread snow and making forecasts tricky. Tuesday is the first chance of any snow this week for the SE as a front moves in from the west to reach the SE around the afternoon, though details this far out cannot be certain. As the front moves into colder air the rain could turn to snow, especially on the back edge as overnight temperatures fall. It is very likely to be snow across the middle of the country and certainly over high ground but snow for the SE is less certain, it could be just sleety or rain depending on the mix and location of mild air from the south in the occluded front. In any case Tuesday looks light precipitation as the front weakens to the east. This doesn’t help snow formation in marginal situations because less cold air is dragged down from aloft in light rain and there is less evaporative cooling in light rain. Charts currently show that Wednesday has a better chance of snow action for the SE as another front, this time with heavier rain, clears east later on Wednesday or overnight into Thursday. Exact timing is uncertain and indeed the development of this might all change despite there being sound model agreement as to the overall synoptic situation into the mid week period. 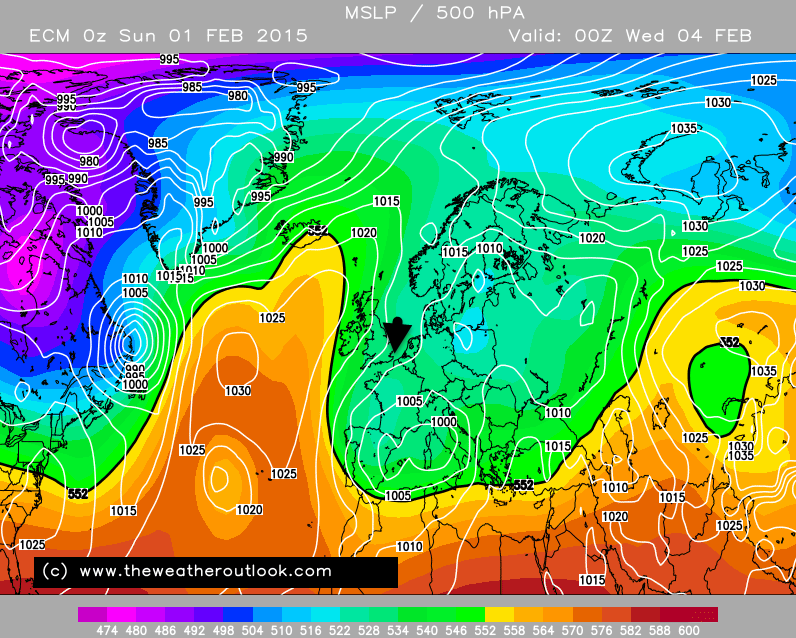 The latest UKMET chart for Thursday shows the SE in a COL between HIGH pressure SW and NE and LOWS NW and SE. 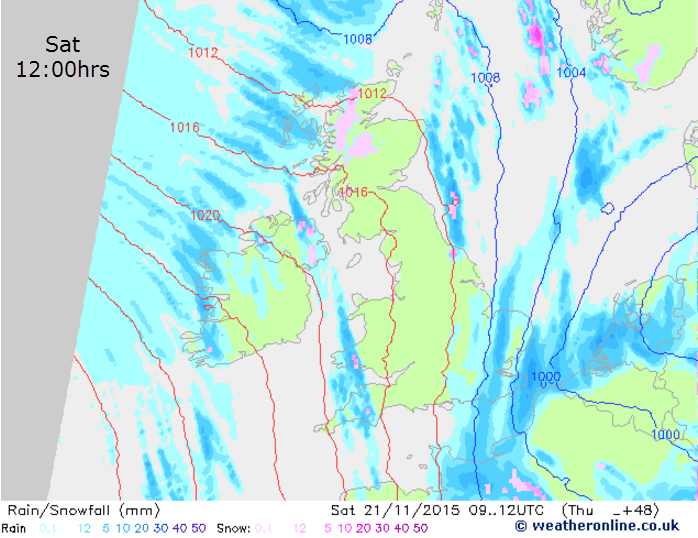 This looks like a cold wet day with sleet for Reigate, but snow is again possible, especially as the LOW drifts south and introduces a cold NE continental flow for a time on the northerly edge. This is most likely to restrict to inland areas or those higher up locally but it needs watching carefully as heavy rain might tip over into sleet then snow due to evaporative cooling. After mid week things look like turning somewhat milder for a while as westerly winds eventually break through properly, possibly by late week or the weekend. This means snow chance reduces to nothing as milder Atlantic winds return. Nevertheless, the long range models still show some propensity towards building further chilly Arctic incursions later too. #Reigate Boxing Day snow prospects? Update Fri 8am! 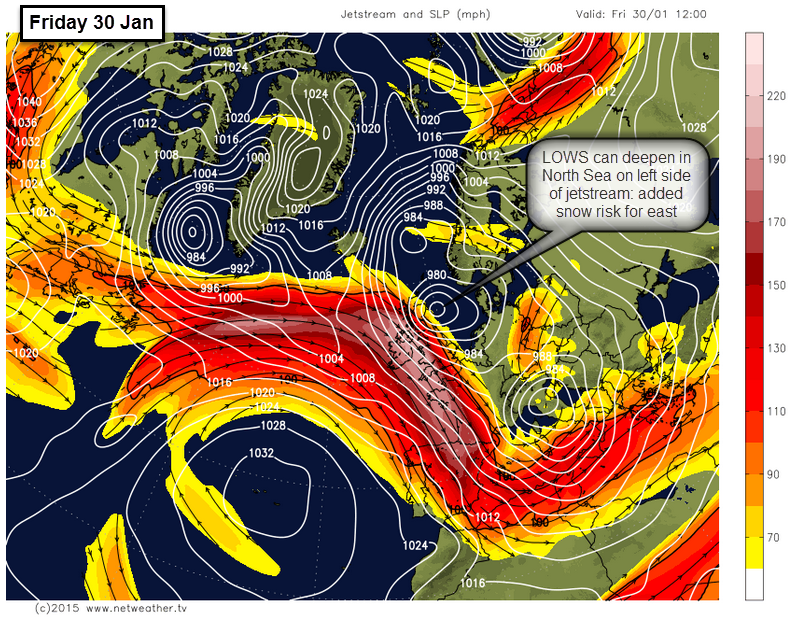 MetOffice chart brings LOW further South… this would bring in colder air more quickly for SE on Sat am possibly interacting with the frontal rain and turning it to snow for a short period, check weather warnings before travelling, especially north through the Midlands and N England and Wales tonight. Quick update on weather prospects for Reigate and SE Boxing Day night and into Saturday 27 Dec. The low pressure storm arriving Boxing Day afternoon is set to bring chilly conditions, lots of rain and some snow, but for who and when? The LOW pressure is set to track overnight ESE through Wales, across the Midlands and exit through the Thames Estuary sometime in the early hours on Saturday. 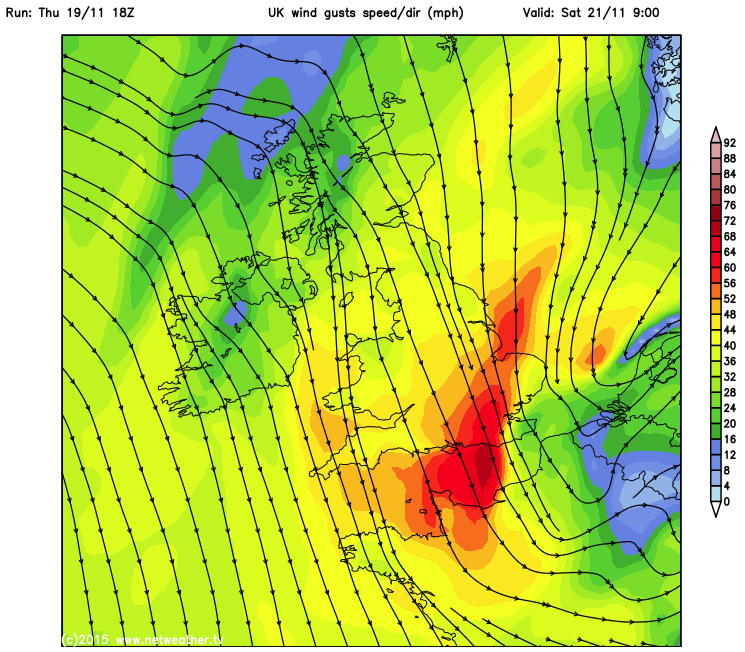 Strong winds are likely during this time, initially W/SW winds for the SE and Reigate building Friday pm/ evening and then veering to brisk cold winds NW/N winds by Saturday morning. Winds could reach 30-40 mph in places and more on coasts possible. Wind chill temperatures overnight will be cold, down to -6C in places. There will also be a lot of rain overnight: possibly 10-20mm in places. It is of course the snow that people are interested in. Whilst snow is likely on the northern side of this low across parts of Wales, Midlands and N England, parts of East Anglia, for us in the SE on the milder south side of the low the snow is initially unlikely and much more marginal and more difficult to forecast. A bit cheeky but couldn’t resist this apt tweet from WindyWilson in Scotland! Overnight snow is unlikely for much of the SE because for much of the night we will sit in the warm flow of air to the south of the low centre. Rain is forecast to arrive sometime mid-late afternoon. Friday will then actually warm up to possibly 6C in the evening in an occluding low as the warm front arrives. This is called warm air advection and is what drives the lower pressure down as air rises. It is also likely to keep any precipitation as rain for most of the night. Overnight this warm air will be forced aloft by the chasing cold polar air sweeping down from the north, this can be seen on upper air charts below. The charts below show snow fall is only likely on the very back edge of the system as the low pressure slips away across the Channel and drags in the coldest air from the N / NE in its wake. It is only at that point , from early on Saturday am, that the Downs and Reigate and the SE might get some snow but, even then, it is only 50% chance (see skew-t below). On the atmospheric cross section (skew t) below for Heathrow the warm air can be seen on the 21:00hrs GMT chart as a slight bulge with increased height. This is an isothermal layer which shows warm air is in the system at this point and likely to melt precipitation starting as snow higher up. The skew-t diagram on the right is for some hours later at 03:00hrs GMT when temperatures can be seen to have fallen at the surface, winds veered to a cool Northerly direction after the cold front has passed through. At this time a rough calculation of Dew Point + Temperature yields 3.3, which would give a 50% chance of snow at this location. Snow might also fall as heavy rain drags colder freezing air from above to the surface. Evaporative cooling, however, is unlikely as a snow making process because it requires less windy conditions. By Saturday morning the polar Northerly air has arrived and this has dew points low enough for any showers possibly pushing in on the NE breeze to fall as snow at any time during the next 48 hours or so. So… snow is unlikely for Reigate first thing overnight Boxing Day, there is a 50% chance of snow for the second half of the night, especially over high ground like the North Downs and especially if the rain is heavy enough. Finally, as dawn breaks on Saturday any rogue showers penetrating our area could fall as snow in the frigid air. This system is set to bring in a cold weekend and early next week a cool high pressure will keep things dry and frosty. After New Year things look to be warming up and turning more Atlantic driven on the latest charts as winds bring rain back from west. Snow fell as forecast by MetOffice across Northern England / Midlands and caused some traffic problems and flight cancellations out of regional airports Manchester and Liverpool. Snow accumulation up to 10cm was reported and some low wind chill. The snow zone was a discrete area and to the south the warm sector kept everywhere south of the Midlands free from snow and, as expected, mild throughout (8C) until the polar air arrived behind the LOW. Some sleety showers and possible snow flurries came and went uneventfully across the SE and especially Kent but no accumulations were reported. The LOW had much more wintry impact into Europe: with Netherlands through to the Alps receiving significant snowfall. 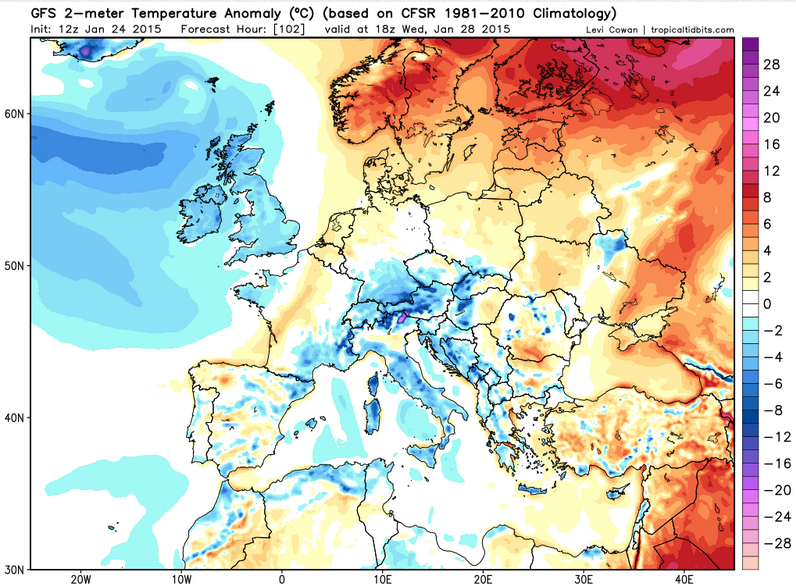 The LOW is forecast to continue SE into SE Europe and drag in some freezing polar continental air into the Balkans, Greece and even reaching as far as the North African coast. Temperatures as low as -20C are expected across Serbia. SNOW fell in Algeria. 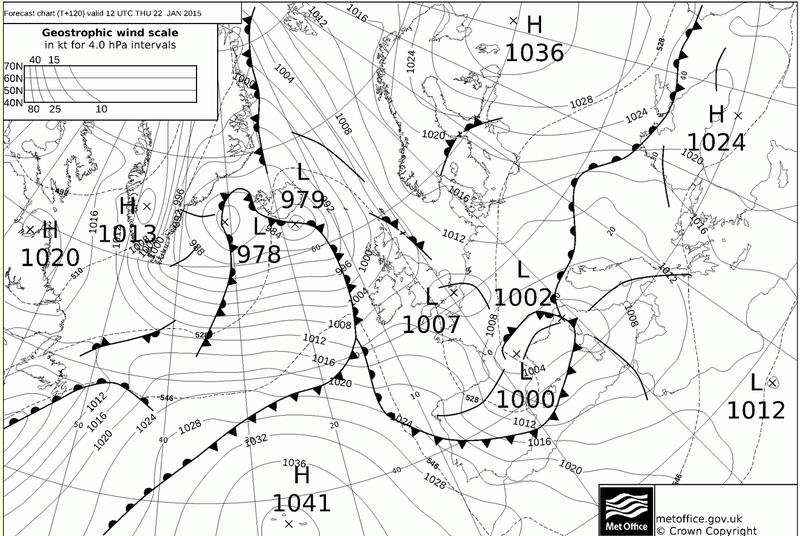 Update #1 25/12/14 latest MetOffice chart lifts pressure and pushes track further south, with low moving SE across our area. This reduces wind speed, still brings in colder air flow though with risk of snow increased for back northern edge of the system with NE winds. For SE possible sleet/snow on Downs early Sat am. Evaporative cooling could yield more snow for SE if rain sufficiently heavy (drags down cold uppers). Gale risk gone but replaced by some heavy rain, marginal snow risk and retaining the cold easterlies in the aftermath on Saturday with pressure building to dry bright frosty conditions. After a pleasantly cool bright and dry Christmas Day, an interesting depression due on Friday and through Saturday is likely to usher in a period of colder weather for the UK and SE in particular. The situation is a little uncertain still but the run of warm mild gloomy temperatures lately this December, already pushed aside gently by a weak cold front passing south through the country today, are likely to be pushed further down into some “proper”cold after the storm passes through by Sunday. This storm, forms in the Atlantic along the polar front and quickly races east towards the UK on Boxing Day Friday. Storms tend not to deepen much if they move fast, which this one does at first: crossing half the Atlantic in a matter of 24 hours. The storm is mixing some airmasses with contrasting temperatures: cold polar air in the north is about to get up close and personal to mild warm Tropical air from the south west. They are due to meet in the LOW pressure over the UK soon, so expect some interesting weather! You can spot the impact of the storm on the upper air temperature chart below but also see the steeper drop to colder conditions thereafter. The ECM charts below show upper air temperatures at around 1500m. These “850hPa” charts are commonly used as guides to airmasses because air at 1500m (850hPa pressure level) is not affected by changes day and night or surface characteristics, it is therefore a good guide to true airmass characteristics. Note the really cold airmass to the north meeting comparatively warm air to the south and SW in this LOW. For the South of England the LOW will initially push warmer tropical air ahead with rain arriving for us in the SE on a warm front sometime Friday pm (top diag above Sat 00hrs). The warm sector is likely to be windy with gusty SW winds and a considerable accumulation of rain, 10-20mm overnight into Saturday. The warm sector tropical air mass (upper air +5C) could have temperatures near double figures whilst the polar air bearing down from the north is a much more frigid airmass (upper air -6C). The contrast between these two airmasses could make the frontal rain particularly heavy while the cold front contrast could even have an odd rumble of thunder as cold air undercuts the warm and forces it aloft. The skew-t diagrams below show the contrast in these two airmasses. The LOW centre crosses the North of England and into the North Sea overnight into Saturday when, due to it’s location under the left exit of the jetstream, it is forecast to deepen to possibly around 980mb. quite low especially for a depression located so near the shore. Deepening occurs as the jetstream aloft encourages air to rise off the surface because air is diverging aloft. So air is rising off the surface quicker than it can be replaced by air arriving: hence falling surface pressure. This commonly occurs when lows interact with jetstreams on their left hand side, near the exit of a jetstreak. The classic frontal depression with cold and warm fronts separated by a warm sector only lasts for a matter of hours before the cold front, pushing forward more dynamically than the warm, catches up the warm front and pushes the remaining warm air into the upper atmosphere. This is an occlusion and signals the end of the development stage of a depression. The central pressure usually starts to rise after occlusion has occurred. Whilst the situation is still uncertain, it is likely that Friday afternoon and Saturday will be windy and increasingly cold as the winds veer clockwise from the SW through to North and finally NE and E. It is the latter NE and E winds that will bring the colder air to the UK and the SE especially. Continental Europe is currently very cold so any air flowing from this direction will be chilly. Cold crisp continental air will stay with us for a while as high pressure builds to the west and pushes north over Scotland while the LOW moves over Europe. 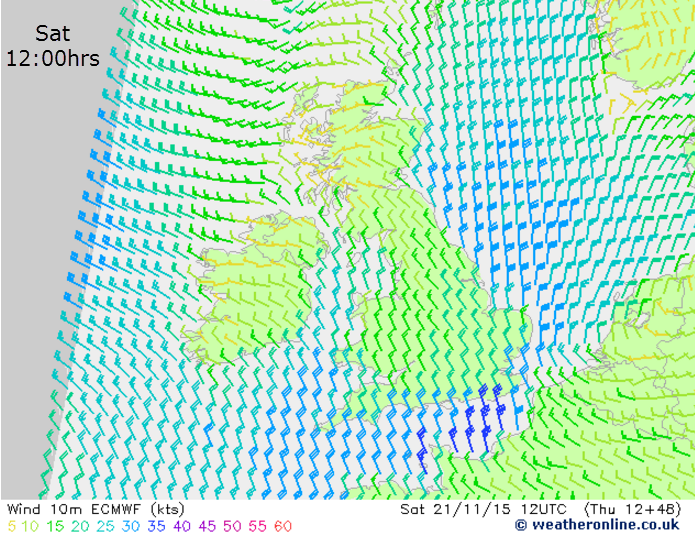 This setup allows easterly winds to flow over the UK. Dry cold is expected as the pressure is likely to rise and stay high. Expect some frosty nights. 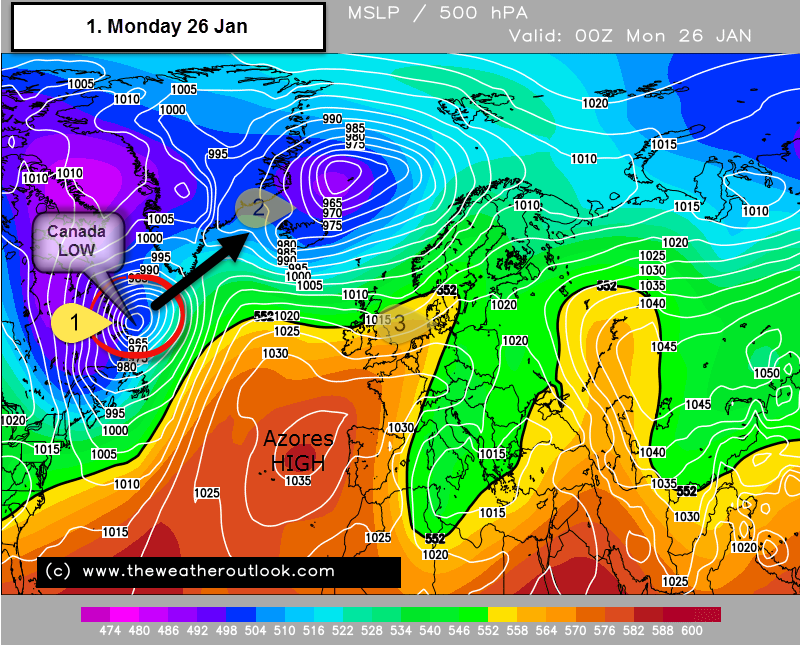 The duration of the HIGH varies between models but certainly should keep things cold and crisp through to the New Year. 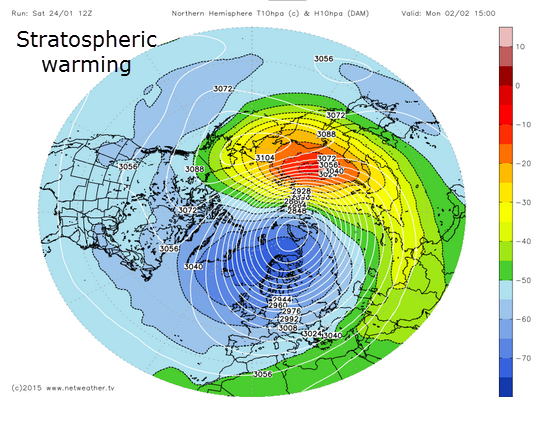 Further ahead a split in the polar vortex and stratospheric warming are dominating weather chat and these are set to possibly bring colder conditions through January. On the other hand, Phase 3-4 of the MJO (Madden Julian Oscillation) is usually associated with a positive North Atlantic Oscillation which brings milder westerlies to the UK. So, it’s interesting times ahead, stay tuned and Happy Christmas! A strong jetstream to the SW of the UK will manufacture some tricky weather over the next 48 hours and continues to make details for the weekend uncertain. Here’s an outline of the likely scenario for Reigate and SE but the advice must be to watch the forecast if you are doing anything weather-related! 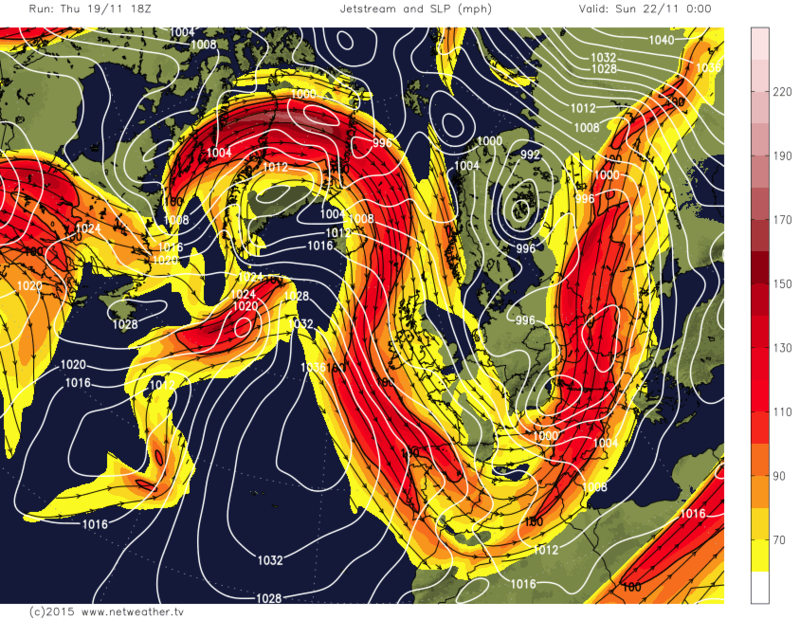 The jetstream is located to the SW of the UK and is blowing strongly from NW to SE. This means the UK is sitting in that vulnerable zone to the cool north-side of the jetstream where active small scale depressions can run-up rapidly and deepen off the left-exit region of the jetstream where temperature and pressure gradients are greatest. These depressions are small scale but can produce a lot of rain and their track is sometimes rather erratic: and tiny changes in track can make a big difference to the weather experienced! Two LOWS are predicted to spring out of the jet from Fri-Sun: the first during Friday – will track directly over SE England and drop possibly 10mm of rain onto Reigate. As they track broadly S and E of UK, these LOWS will, in turn, swing the winds into a much cooler northerly or NE direction. Reigate is unlikely to get any strong wind because the LOW pressures are due to pass almost overhead… meaning we are likely get mostly light wind but potential for heavy showers as the cool polar air “warms through” during any sunny periods which will cause convective uplift and showers. There are also occluding fronts wrapped round these systems that could bring more persistent rain at times. The second LOW emerges on Saturday and is currently due to track off in a more southerly direction through France but could bring rain across S coasts. This one needs watching carefully as any movement north will cause a much wetter and unsettled Saturday than is currently on forecasts: which currently show Sat largely dry but with some poss showers later. Showers are possible as the cool air warms through and sparks convective showers on either Sat or Sun. Higher pressure ridges between these lows will bring cold nights, possibly frosty in places if cloud clears. The complicating factor is that pretty cool air is wrapped up in these depressions, almost cool enough for sleet and wintry precipitation at times later on Friday for Reigate and during almost any showers that rotate around the remnants of the LOWS during Saturday and even into Sunday. Whilst wintry ppt is unlikely for Reigate, further north and over hills in Wales and N England there will be snow, probably patchy. short lived temporary wet snow at lower levels but accumulations possible over higher ground. 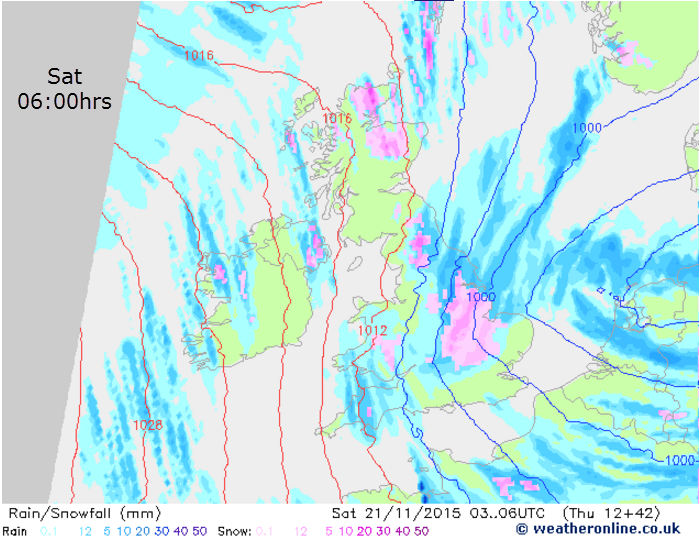 The only way Reigate will see any fleeting proper snow is if we get any HEAVY rain during the passage of fronts later on Friday and any showers left behind in low pressure Sat/Sun. All rainfall during this period will start as snow aloft, in fact almost all our rain in the UK starts as snow up high and simply melts as it descends. However, if rainfall is heavy enough it can actually COOL the air sufficiently so that further precipitation falls as snow. This is called evaporative cooling: some rainfall always evaporates on descending to the ground, even in cold weather. If enough rain evaporates then this will cool the air sufficient for freezing levels to fall to the surface and then, bingo, snow will descend to the surface as well! So, whilst rain can NEVER “turn to snow” (completely impossible! ), it is possible for heavy rainfall falling through a sufficiently cool air mass (around -5c at 850hPa), to cause snow to reach the surface.